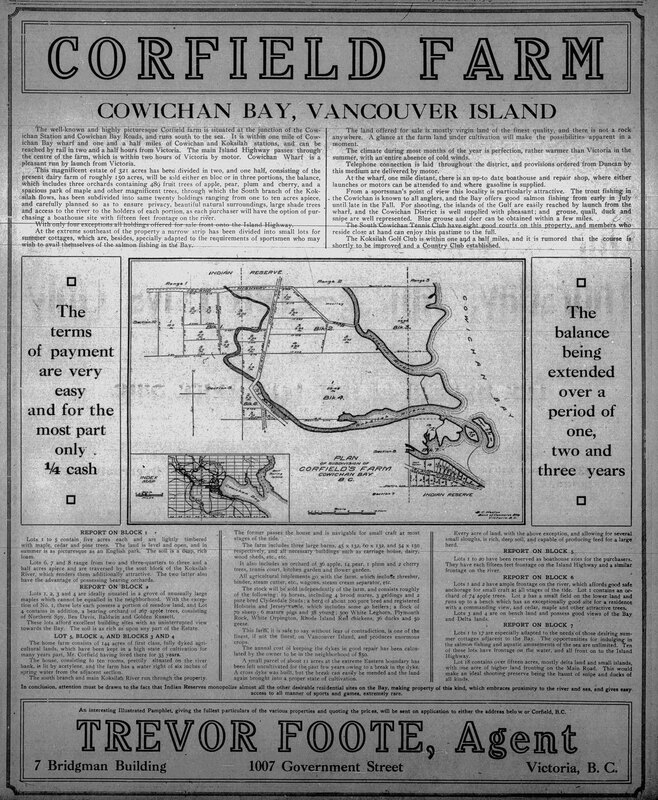 While doing some research on various topics, we came across this 1913 advertisement for the subdivision of Corfield Farm, which had been established by George Corfield and, until 1913, had been one of the largest family run farms in the Duncan area. 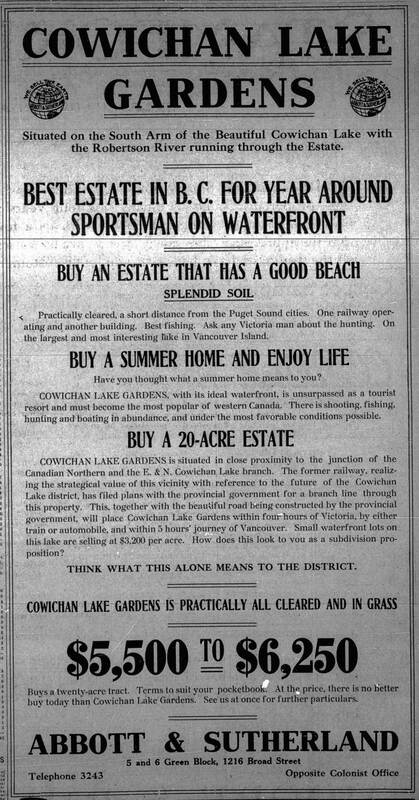 Using the map in the above advertisement, we have tried to replicate the location on this Google Map by using the South Cowichan Lawn Tennis Club, 2290 Cowichan Bay Road, located at the intersection of Cowichan Bay Road and Tzouhalem Road, as a central location since it is located within the area shown in the advertisement map of the Corfield Farm subdivision. Corfield family members Norman Tressidor Corfield and John Frederick Corfield were both instrumental in creating a landmark downtown Duncan building, the Duncan Garage. In 1913, when the subdivision of their family’s Corfield Farm was being undertaken, Norman Tressidor Corfield was building the Duncan Garage for his automobile dealership and garage business, Duncan Garage Ltd.
Another historic connection to Corfield Farm is through the poet Robert Service (1874-1958), who worked for George Corfield on Corfield Farm for four years as a cowhand and,later, as a storekeeper. 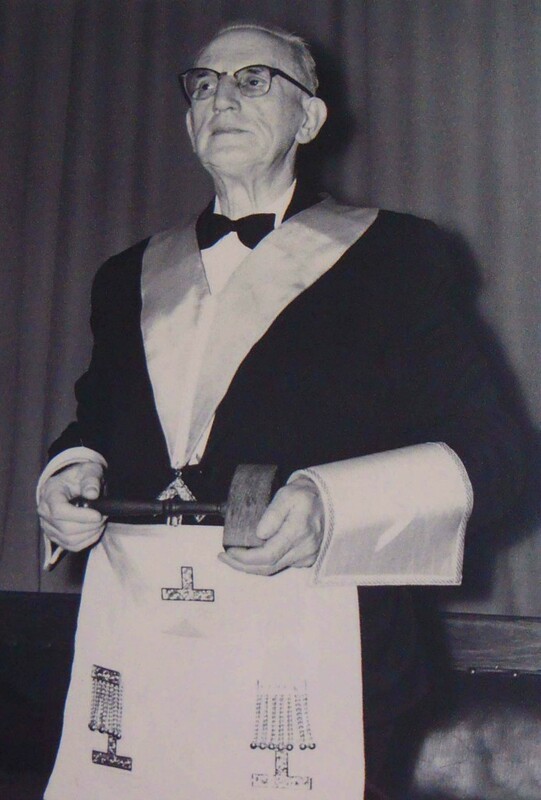 Robert Service also acted as a tutor to George Corfield’s sons, Norman Tressidor Corfield and John Frederick Corfield, both of whom later became involved in the Duncan Garage business. This Times-Colonist story on Robert Service at Corfield Farm is excerpted from a biography of Robert Service by Enid Mallory. 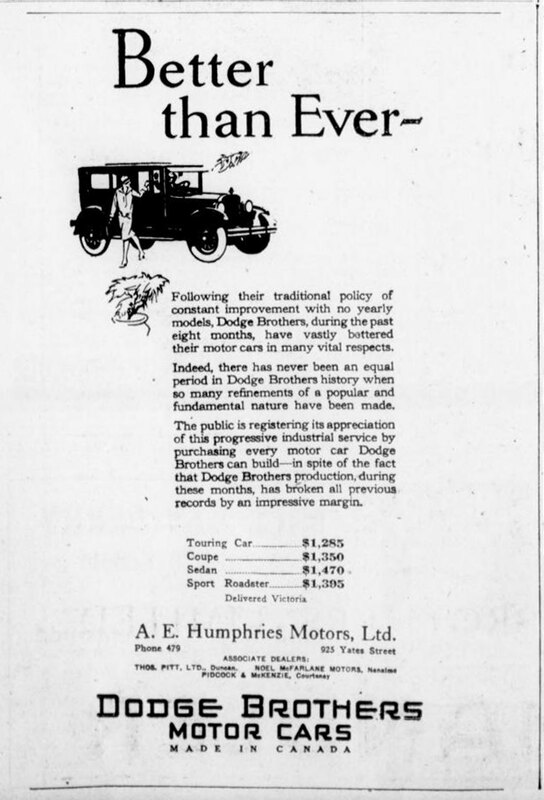 As part of our series on Historic Duncan Advertisements, Automobile Advertisements, 1920-1929 here is a 1926 advertisement for Dodge Brothers Motor Cars and its Victoria, Duncan and Vancouver Island dealers. 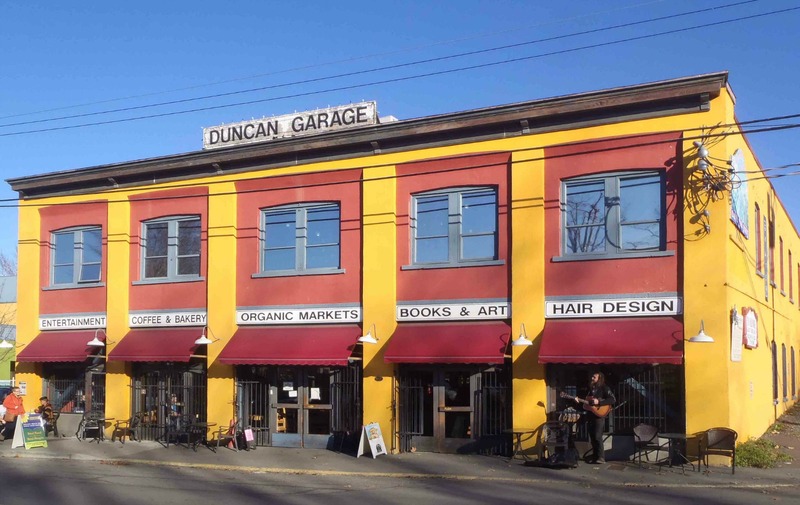 In 1926, the Dodge Brothers Motor Cars dealer in Duncan was Thomas Pitt, whose Duncan dealership was located at 261 Government Street, at the corner of Government Street and Kenneth Street. In 1929 Thomas Pitt retained architect Douglas James to design and build the present building at 231 Government Street as an offices for Thomas Pitt’s car dealership. Unfortunately, Thomas Pitt’s automobile dealership went bankrupt in the Great Depression. 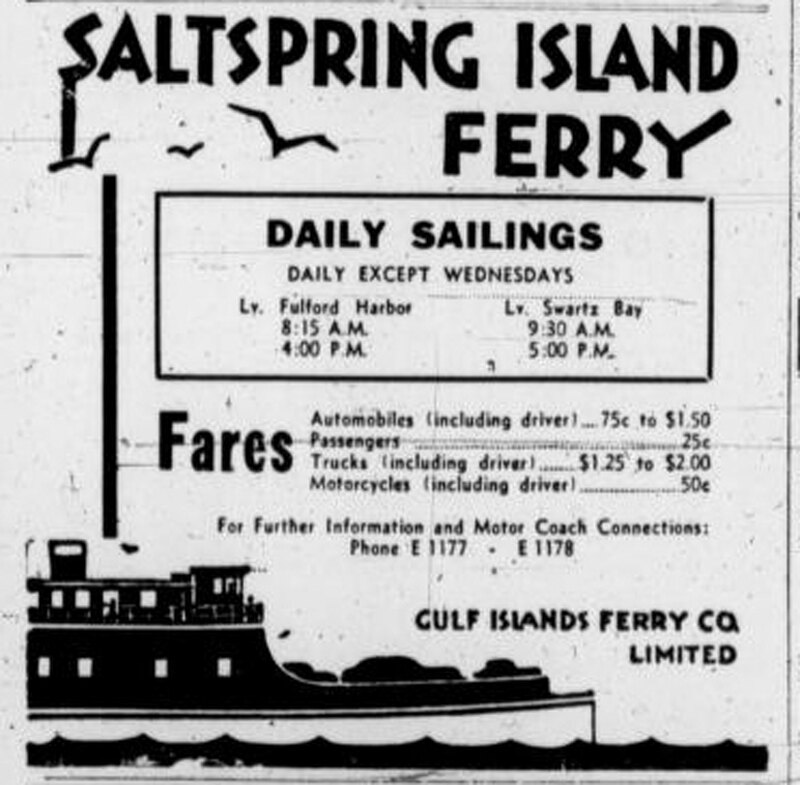 As part of our series on Historic Duncan Advertisements and Historic Duncan Advertisements – Transportation here is a 1940 advertisement for the Salt Spring Island Ferry. Note that in the days before BC Ferries, it was operated by a private company, the Gulf Islands Ferry Company Ltd. Note that there were only two sailing per day but no sailings on Wednesday. Also note the prices: $5.500 to $6,250 for 20 acres of waterfront property. 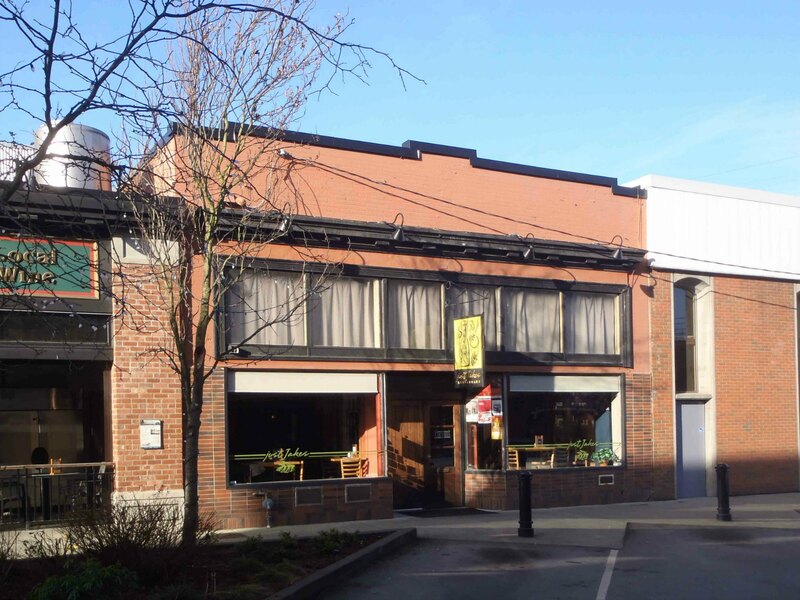 Abbott & Sutherland was located in the Green Block, 1216 Broad Street in Victoria, This Heritage Building is still standing and is listed on the Canadian Register of Historic Places. As part of our series on Historic Duncan Advertisements, Automobile Advertisements, 1940-1949, here is a 1946 advertisement for Firestone Tires and its Victoria and Duncan dealers. In 1946, the Firestone Tires dealer in Duncan was Gray Motor Company, whose Duncan dealership was located at 261 Government Street, at the corner of Government Street and Kenneth Street. Notice the “Tire Rationing Removed” in the upper right corner of the advertisement. Tires had been rationed during World War II (1939-1945). 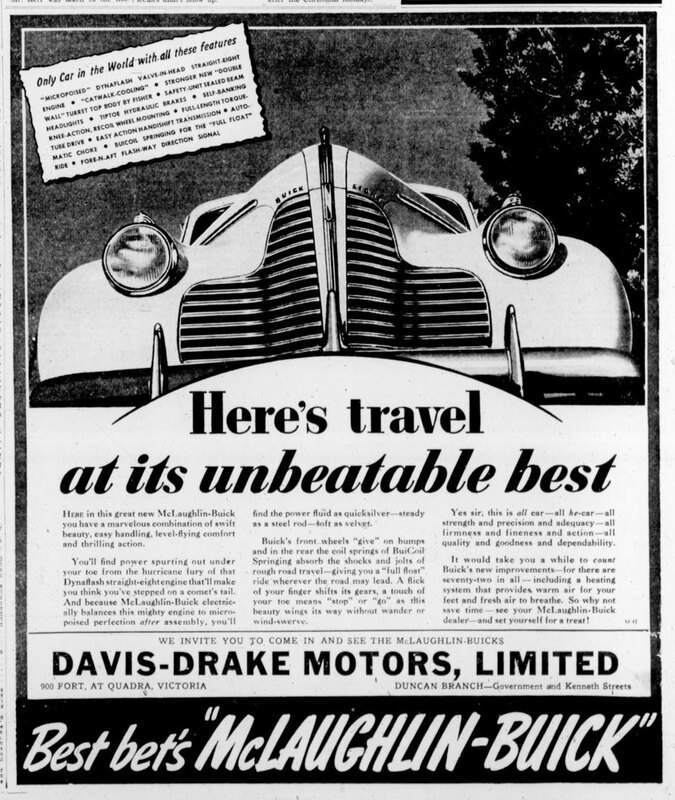 1939 Advertisement For McLaughlin-Buick and Davis-Drake Motors Ltd.
As part of our series on Historic Duncan Advertisements, Automobile Advertisements 1930-1939, here is a 1939 advertisement for McLaughlin-Buick and its Victoria and Duncan dealers. 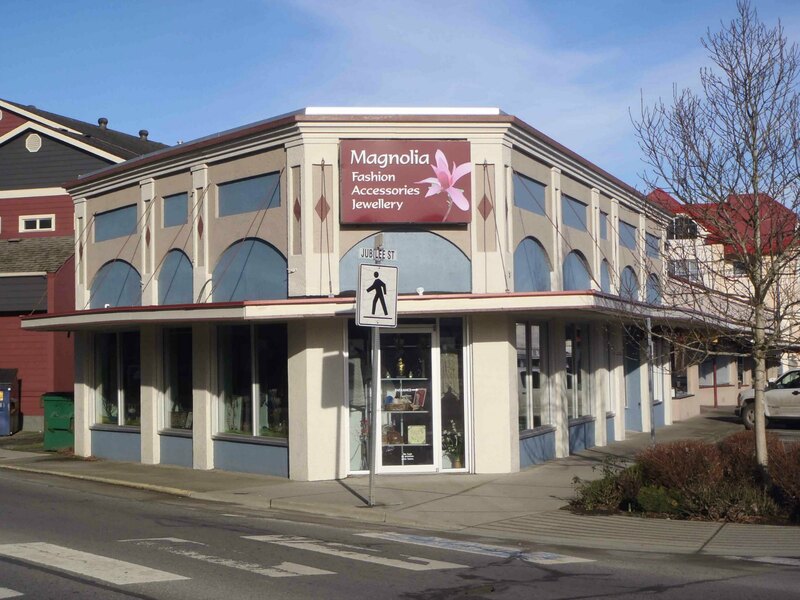 In 1939, the McLaughlin-Buick dealer in Duncan was Davis-Drake Motors Ltd., whose Duncan dealership was located at the corner of Government Street and Kenneth Street. Davis-Drake Motors Ltd. also had a Victoria dealership at 900 Fort Street. As part of our series on Historic Duncan Advertisements, here is a 1930 advertisement for Vancouver Island Coach Lines showing the Duncan bus schedules at the time. “A Streak of Orange…The Staccato Hum of the Exhaust, and It’s Gone!” LOL! It is unlikely any transportation company today would be advertising about “The Staccato Hum of the Exhaust” or “A Streak of Orange”. 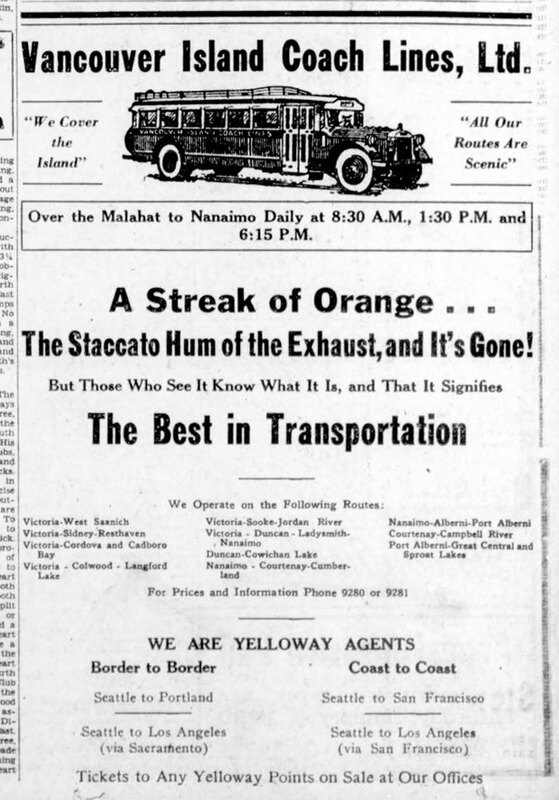 As for the “Streak of Orange” we are guessing the Vancouver Island Coach Lines buses of the period were painted orange. We are looking for a colour photo from the period to confirm that. Vancouver Island Coach LInes is now owned by Wilson’s Transportation. 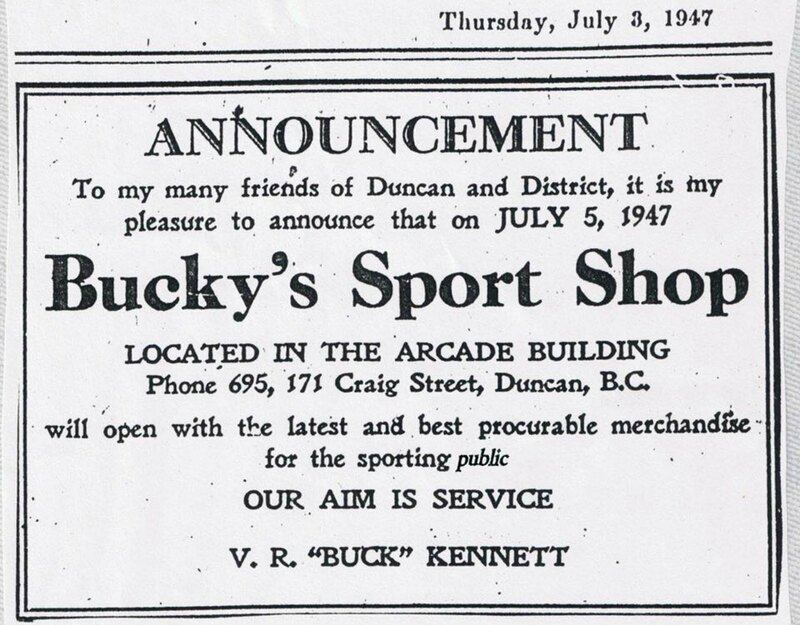 As part of our series on Historic Duncan Advertisements, here is a July 1947 advertisement in the Cowichan Leader announcing the opening of Bucky’s Sport Shop, 171 Craig Street, at the corner of Craig Street and Kenneth Street. Although the Arcade Building mentioned in the advertisement has been demolished, Bucky’s Sport Shop is still in business at the same location. Here is a link to more information about Valentine Richard “Bucky” Kennett. 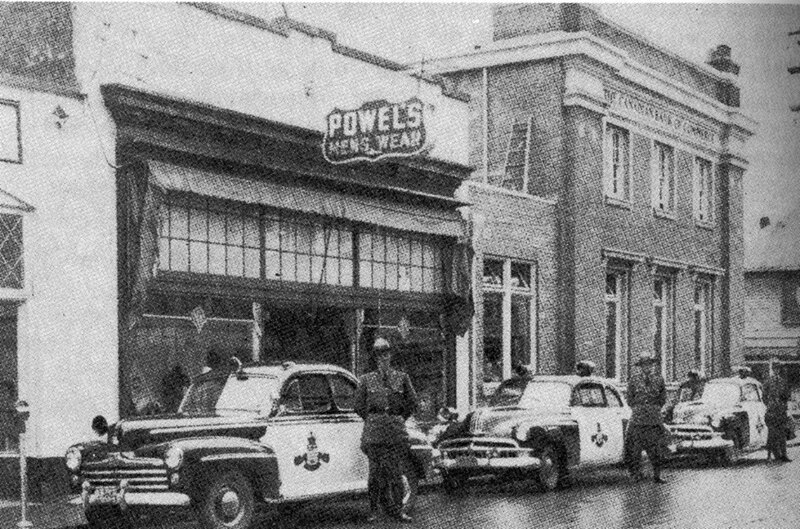 We came across this photograph of 45 Craig Street, circa 1950, when the building was occupied by Powel’s Men’s Wear. 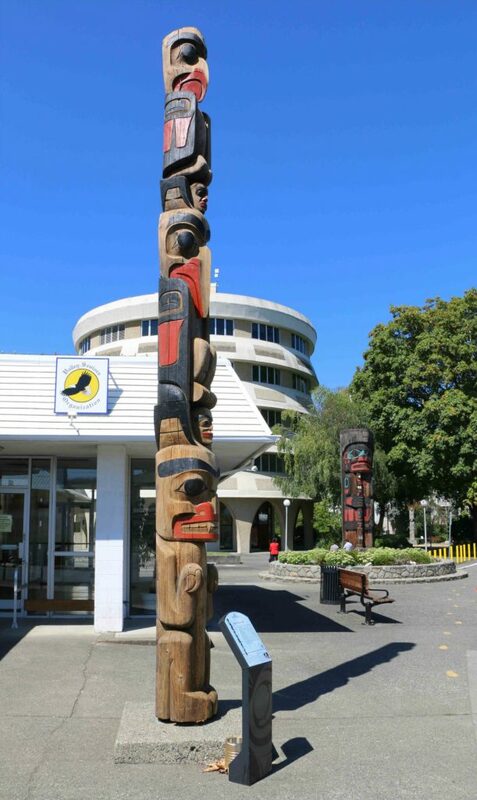 The building at the right of the photo was the Canadian Bank of Commerce building, now demolished and replaced by the current CI.B.C. branch at the same site. Here is how 45 Craig Street appears now from approximately the same angle. 45 Craig Street was designed and built in 1922 by architect Douglas James for Harold Fairfax Prevost, who used it for his stationery business. 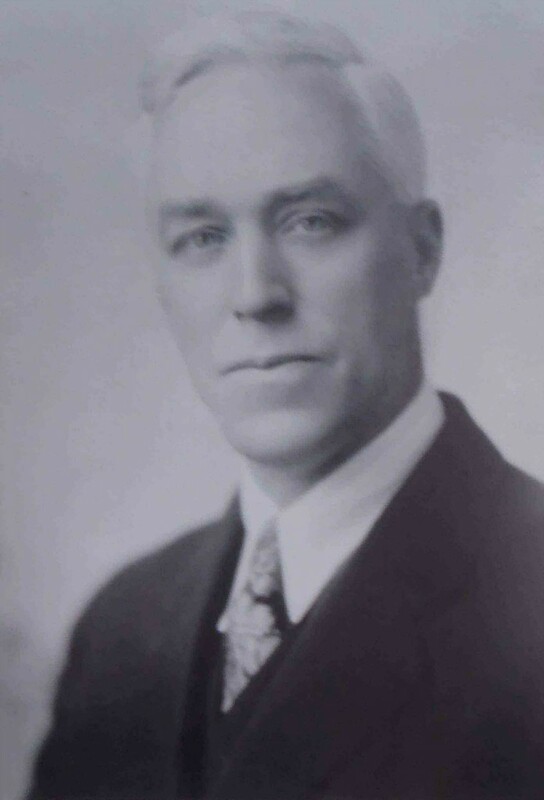 Harold Fairfax Prevost was also Mayor of Duncan. 45 Craig Street is now Just Jake’s Restaurant. Here is a photo of Harold Fairfax Prevost, who had 45 Craig Street built in 1922. 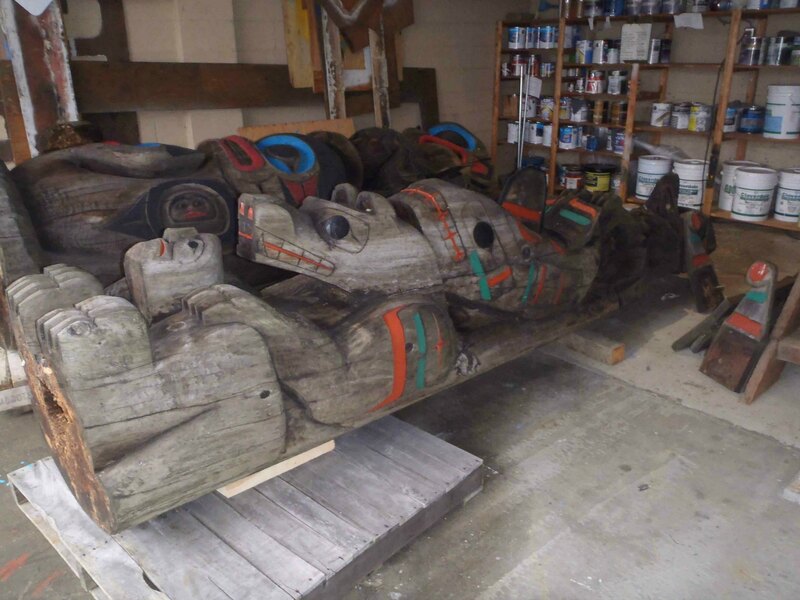 In the fall of 2015 four totem poles from the City of Duncan collection were removed from public display and placed in a City of Duncan Public Works facility for maintenance. 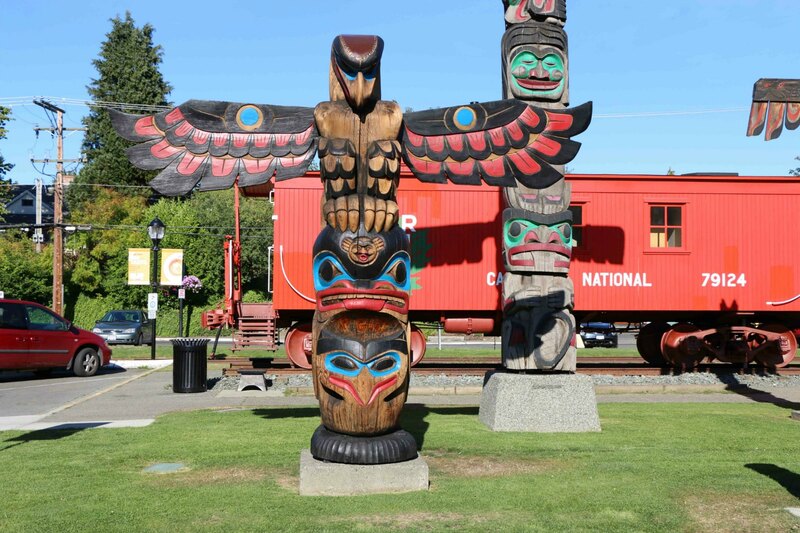 Eagle Raven Bear and Raven Stealing The Sun totem poles during maintenance, 2016. 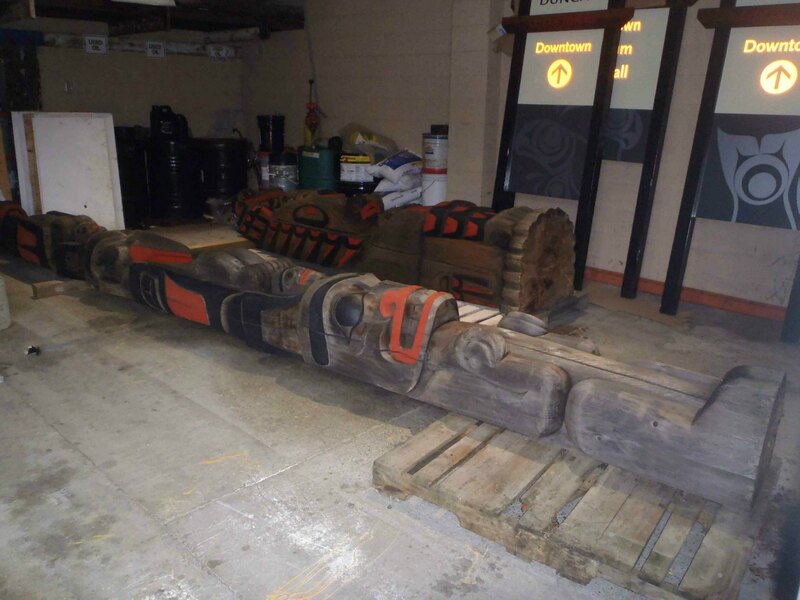 These poles have now been repaired and put back on public display. 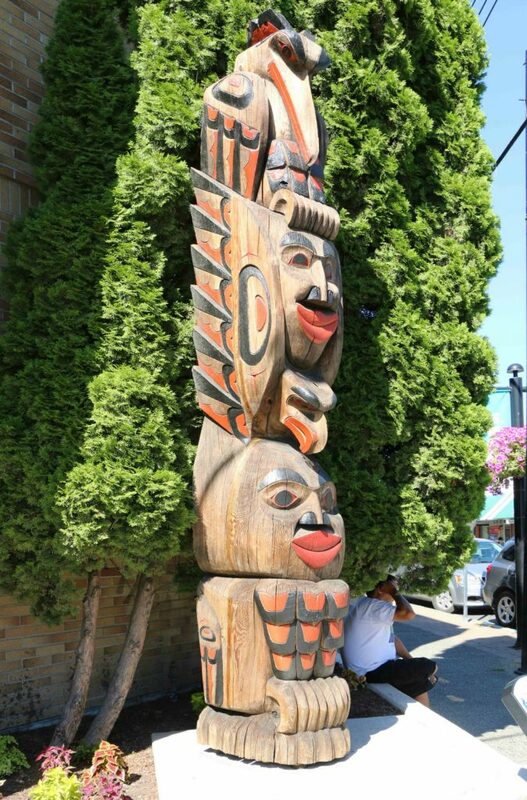 Pole of Wealth, Government Street at E.J. Hughes Place. 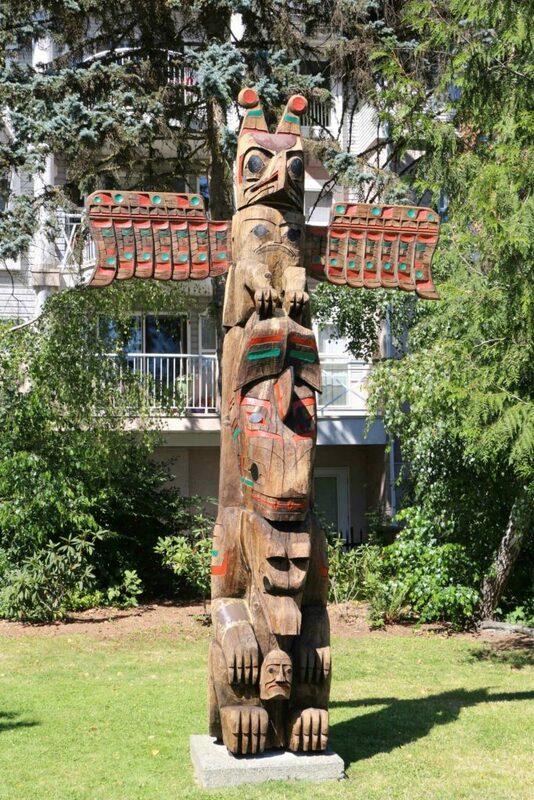 Raven Stealing The Sun, Station Street at Canada Avenue, Duncan, B.C.